It is one of the most scandalous incidents ever to have disturbed the televised narcolepsy that is Professional Cricket: on this day in 1981, Australian captain Greg Chappell instructed his brother Trevor to bowl underarm to New Zealand batsman Brian McKechnie. It was a one day match at the MCG in Melbourne, the third of five in a series, and so far the series was tied 1-all. And on the last bowl of the day, McKechnie, if he hit a six, could tie the game. The infamous underarm bowl was intended to prevent this from happening. It was legal under the rules of the game, but it was widely seen as unsporting behaviour, not living up to the spirit of fair play. 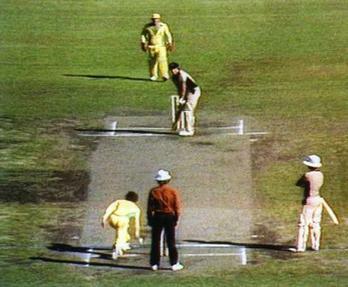 The rules of One Day International Cricket were changed after the end of the 80-81 season to prevent a recurence of the event, and the bad reputation it gave them has dogged the Chappell brothers (more Trevor than Greg) ever since. Tagged 1981, Feb 1, Midnight Oil, One Day Cricket, The Power And The Passion, Trevor Chappell.